Arhar Dal Palak | Simple Spinach Dal is a simple and nutritious dal mainly made with arhar dal/tovar dal/split pigeon peas lentils and spinach. 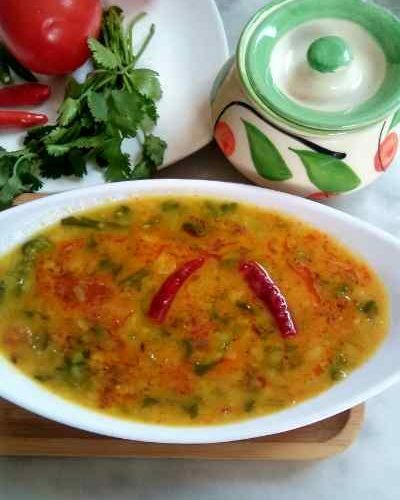 Though there are many variations of this dal. 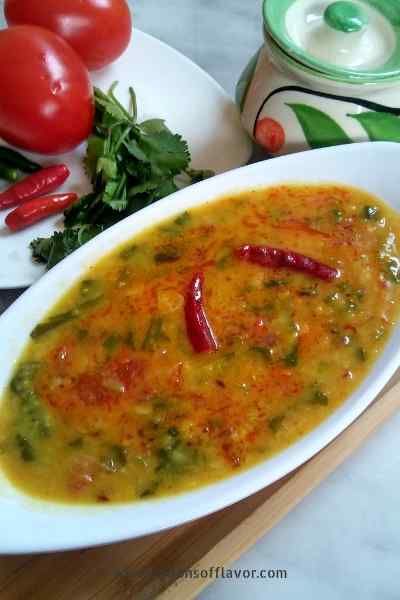 But this recipe will give you a simple, tasty, light everyday dal. And is also completely vegan and easy to make. It can be prepared within half an hour of time. Pair this with some steamed rice or roti and enjoy a hearty, comforting meal. 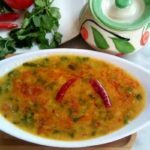 This arhar dal palak starts with pressure cooking the dal and palak together, then followed by a tadka/tempering. Here the dal has to be slightly thick. Hence it is important to make sure you don’t add too much water while cooking. No ghee/clarified butter has been added here. I love to keep this light. But if you want you can add. Here the addition of dry red chili is optional. Adjust heat as per your taste buds. 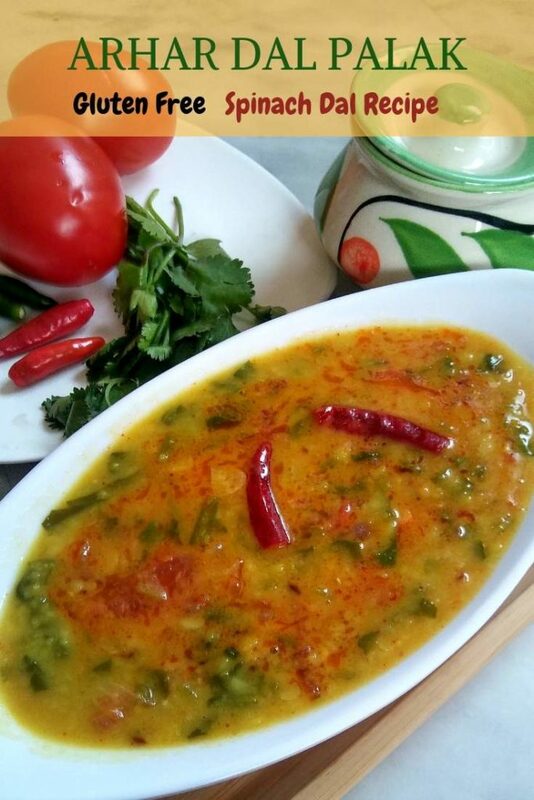 Let me know your thoughts about this arhar dal palak in the comment section. Also, you can connect with me on Instagram, Facebook, Pinterest, and Twitter. Arhar Dal Palak | Simple Spinach Dal is a simple and nutritious dal mainly made with arhar dal/Tovar dal/split pigeon peas lentils and spinach. Wash arhar dal properly and soak it in water for half an hour. Wash and trim the palak leaves properly. Drain excess water and chopped them roughly and set aside. Drain water from the dal and pressure cook for 3 whistles over a medium flame by adding with chopped spinach, salt, turmeric powder, 1 tsp oil, and water. Once done turn off the flame and let the cooker releases its pressure. Heat oil in a pan. Add cumin seeds. Once cumin seeds start spluttering add chopped garlic and saute for few seconds. Add chopped onion and chopped green chili. Stir continuously until the onions turn slightly golden. Add chopped tomatoes, salt, asafoetida, and dry red chili. Saute for some seconds. Then cover and cook for a minute until tomatoes soften. Once done fry for a minute more. Then add red chili powder. Stir to mix and immediately add pressure cooked dal and palak. Stir to mix and adjust seasoning. Turn off the flame. Arhar dal palak is ready to serve. Serve hot with piping hot rice, roti or paratha. The flavors in this sound incredible. Def something I would like to try making in the future! The flavors in this look absolutely incredible. Def something I want to try! I am all about trying the flavours of the world. This sounds wonderful. I can imagine the aroma as this cooks. What a great dinner any night of the week. I love anything with a good chili flavor, so this sounds perfect for me. Definitely giving this a try soon! What a flavorful and beautiful looking dish. I can’t wait to try this on a cold winter’s day like today! The flavors here sounds fantastic together. I would love to give this spinach dal a try! This reminds me of something I tried in India a couple of years ago. What an authentic dish! I’d love to taste it. I am pretty sure the flavors pop in this soup. Anything with split pigeon peas has the best flavor. I am Puerto Rican and we use them for rice and the flavor is like none other. I love Indian food, especially dal and palak dishes. This is fantastic. I’ve never had dal but I’m always up for trying new things. Thanks for sharing this flavorful recipe! This dal recipe is great. It sounds simple to make and very flavourful. Def one to try! I would love this over a little rice with some naan. What a delicious and flavorful recipe! Thanks for sharing! The pleasure is all mine😊 Thanks for connecting!